We know a lot about what to eat (fresh fruits and vegetables) and what not to eat (yeah, the whole bag of potato chips). 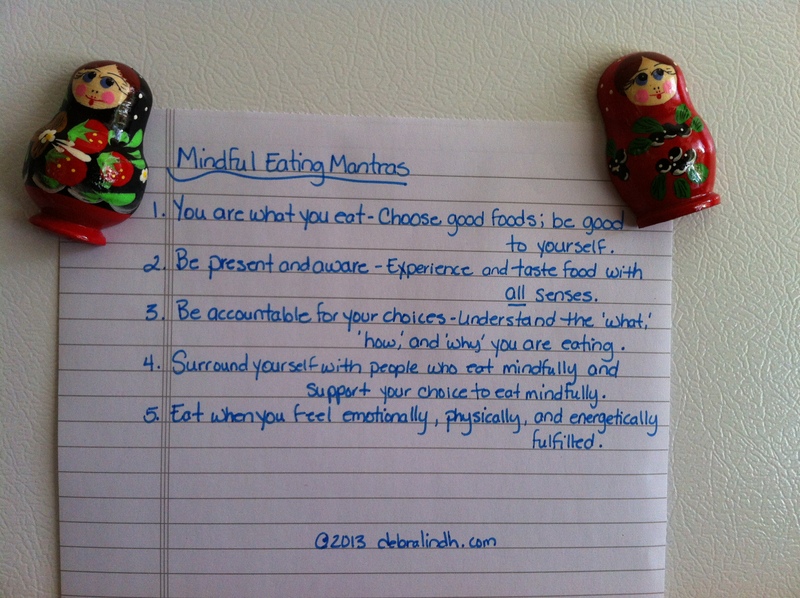 But what about the how, what, and why of eating mindfully? Combining the how we eat, what we eat, why we eat with mindfulness means that we eat with awareness. It’s not that people don’t already know that eating potato chips or fast and processed foods are not the best sources of nutrition. People already know these food sources are not good for them. So, why do we eat this stuff? Why are we still grabbing the fast, quick, to-go foods? This is where mindful eating brings “awareness” to what we are eating, why we are eating, and how we can develop a new relationship with food. For example, when grabbing a handful of candy at the office ask yourself the question “Is this really what I want to eat? Why am I eating this…for a sugar rush because I’m tired?” People might just find themselves understanding their real reasons and triggers for eating something. For some, this awareness can be a big “ah ha” moment to make changes with eating habits. Another example, when eating any meal, become aware of the foods on your plate, how fast you eat, and how the food tastes. Often, people are in such a rush, eating a pile of food on the plate in record time becomes an automatic way of eating. Instead, try sitting down at a meal and make the experience different by eating new foods, slowly enjoying a meal and savoring the flavors, or changing the dining environment. While doing these new things become aware of the changes. You may experience feeling full earlier, notice the food tastes better, decide you no longer like a particular food, or the new surroundings may put you in a better mood. By becoming aware and practicing mindful eating, people will begin to notice subtle changes emotionally, physically, and energetically; your mood, your body, and overall sense of self. To further the practice of mindful eating, try keeping notes of your experiences in a journal or electronic tablet. Review and use your notes of foods that make you feel better as part of foods to include on shopping trips. Mindful eating is about taking time to enjoy eating, to be aware of what we eat, how we eat, and why we eat that ultimately cares for us in the best way emotionally, physically and energetically. Please share additional tips in the Comments section or on our twitter feed.